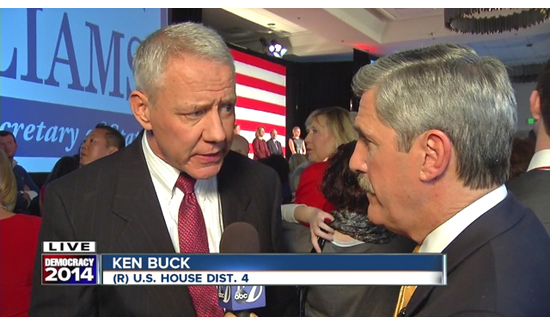 Ken Buck (above left) is the Weld County District Attorney and congressman-elect for Colorado’s 4th Congressional District. Have we forgotten 9/11? Do we remember the police officers, firefighters, and EMS teams who died trying to save innocent victims of a terrorist attack? Alongside brave firefighters and selfless EMS teams, 23 courageous New York City police officers and 37 Port Authority officers gave their lives that day without hesitation. As district attorney, I see that courage every day from our law enforcement officers and know the price they pay. I visited an officer in the hospital a few hours after he was shot trying to make an arrest. I have thanked an officer with a broken arm, the result of saving an innocent child. And yes, I have consoled a grieving widow minutes after she found out that the sheriff’s deputy that she married a few years earlier had been murdered by a dangerous criminal. What’s happened to this beautiful country since Obama took office is a travesty! He and his cronies sbould be ashamed. Never in my 67 years have I witnessed such divisiveness and race baiting. And to think I actually voted for him!!! !